Despite the mix of cool spring showers with our sporadic spring sunshine, we're slowly inching our way towards warmer days. So much so that I removed our woolens from the hall tree and replaced them with wicker, straw and jute. Here's the other side of the entry. The light through the window offers a bright welcome. Love, love, love it! Your pictures too! 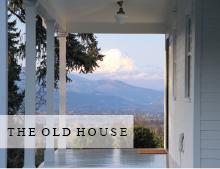 Such a beautiful blog and your home...amazing. It must be amazing to experience spring after such a cold winter. Before I entered the blogging world, and made so many friends in the northern hemisphere from it, I really didn't have a proper understanding of just how much spring must mean when the winters are so very cold. Even living in London didn't prepare me for that. Living in Australia, we get excited when the winter means we can put on a coat, or a jumper! Your tulips look really beautiful, and represent the sweet spring sunshine. Lovely and welcoming :) Enjoy the warmer weather! Beautiful! We are ready to clear off the porch this weekend as the pollen is finally starting to subside. The tulips are beautiful. I can feel the warmth of summer through your images! Our entryway has a lot of natural light too. So much nicer than a dark dreary space, isn't it? Love the jute bag! Picture perfect! That's a gem of a hall tree. What a gorgeous piece of furniture and the display is so inviting. This is my first time to visit so I'm off to have a look around your blog. Beautiful hall tree and entry...bright and fresh! What a wonderful bright and sunny entry you have...I love all the windows. I love your hall tree...I don't think I've ever seen one quite like it before. Our weather here in Kansas is finally acting like it's spring ...we've gone from high 40's during the day (we had warmer temperatures in January! )to mid-seventies today to 85 this coming Saturday. I hope you enjoy a beautiful warm day. Beautiful home you and your husband have created together. It is so full of bright light.After the winter I am ready to change our great room wall color. It is full of windows, but very dark because of the deep wine shade. I am ready for white. I have several guilded framed art and some photographs framed in black. My window treatments are sage jaquard and burlap drop cloth panels.Sounds strange but it works.Any suggestions on a white paint? 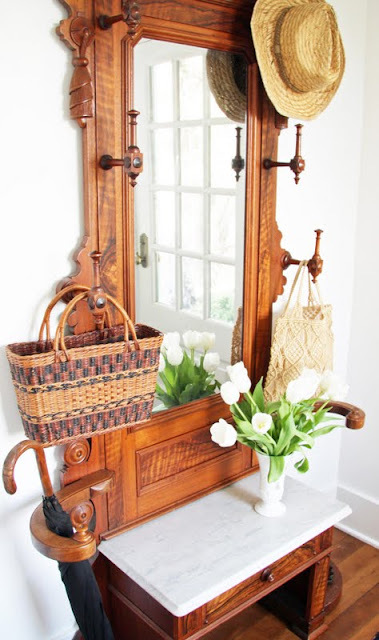 What a lovely light filled entryway! We are having cool showers today too, but it's been so warm lately that the coolness is a welcome change! So sunny and friendly, I love it! just beautiful Trina! and what a sweet, sweet hubby!! This just brings a sigh of relief. Very Pretty! Beautiful. 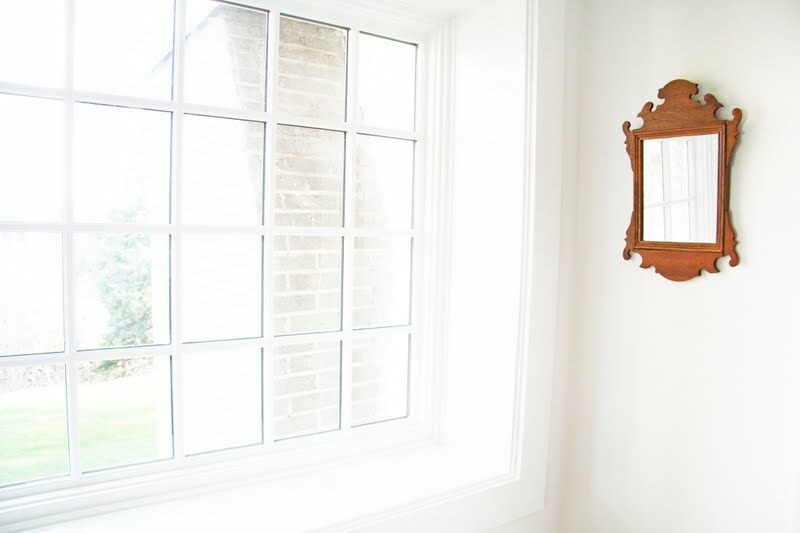 You are historically accurate in placing your mirrow directly next to the bright window. This allowed for folks (pre electricity) the best light to see themselves! This area looks so beautiful. It is so light and pretty.Your hall tree is awesome and what a blessing to get such beautiful tulips from your husband!! What a lovely entrance you have. Looks so sunny and nice. So bright and sunny for your entrance! The vingette and flowers are beautiful! I've been looking for something just like this! What a beautiful piece! The light on that wood is stunning. Gorgeous! Your home is so inviting and warm! What a beautiful piece to set off the entry! We're well into spring now. I've just spent ages sweeping up all the fallen cherry blossom in our drive. Your hall tree is so amazing...I think it's my favorite piece of furniture in your home...it's very fortunate to have you to take care of it. The tulips are lovely. I saw lilac's on the verge of budding today...so excited!! Such a beautiful hall tree! For years we lived in sunny California. It was wonderful....and sunny that's for sure! The children were babies and the days went by so nice and slow. It seemed like we had all the time in the world. We have now lived in Kentucky for almost 10 years. The Seasons change everything! Routines, slipcovers, furniture placement, and the garden too! The children are now teens and the time is flying by. I guess the change in the seasons is a good thing....it wakes me up, keeps me alert and amazed at how quickly time goes by. Oh dear, I'm getting quite sentimental, sorry. Back to the garden...I am still so surprised that every year, like clockwork, new green life emerges from the cold hard ground. That mother nature....she sure keeps us on our toes doesn't she? Love the light Trina that always shines from your country farmhouse. Thank you for sharing it with me. 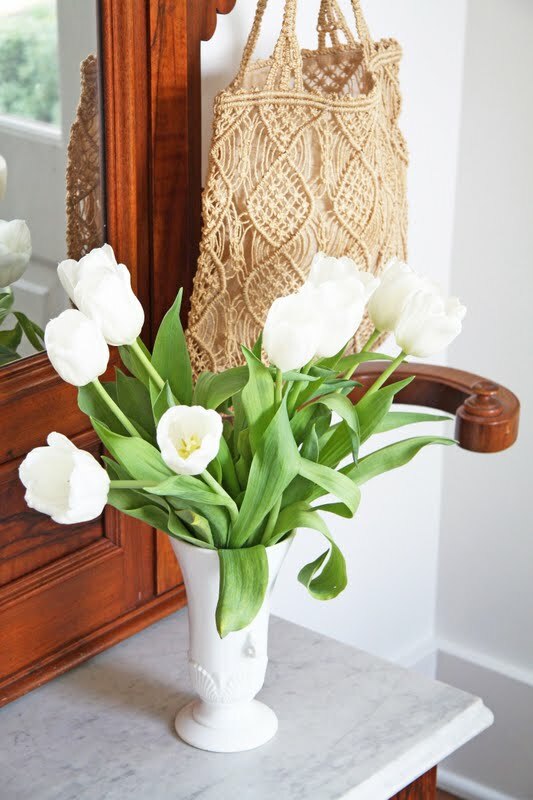 So true, love your spring style with wicker, straw and tulips! We as well did a large reno outside and in to welcome spring in style! We've got a new front door with windows and there is suddenly so much light! Bliss! Love the sleek minimalist feel paired with the warmth of the deep wood tones. Very beautiful indeed.